There are about 391,000 known species of plants in the world, depending on how you define things. Of these, about 1000 species are carnivorous, having developed the ability to digest animals to enable them to survive in places where they cannot get the nutrients they need from the soil. They mostly eat insects, but some of the larger ones have been known to consume frogs and small birds and mammals. 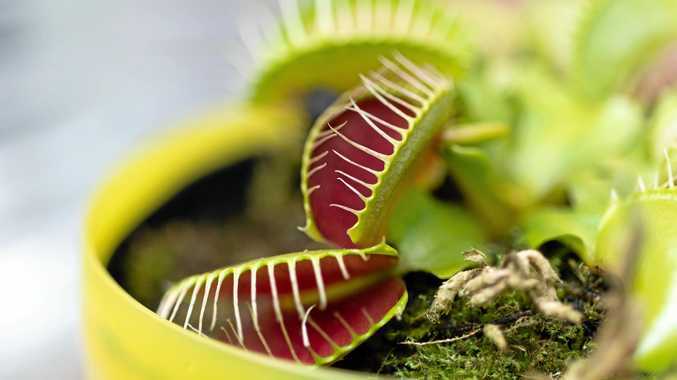 I think everybody has at least heard of the venus fly trap (dionaea musipula). Occurring naturally as a ground cover in open forest areas of Carolina in the United States, the venus fly trap produces a short, fleshy leaf with a modified tip that forms two sides of the trap. Each side of the trap contains tiny hairs which, when touched a couple of times, cause the two sides to spring shut, thus trapping the insect inside. Pitcher plants (sarracenias) use sweet nectar in the mouth of the pitcher to lure insects into the trap. Once an insect enters, it has no chance of escape - the inside of the pitcher is slippery and may have downward pointing hairs, leaving the insect to be consumed by the digestive enzymes. The leaves of the pitcher plants are beautiful; some are short and plump, others are tall and majestic. They are available in a range of colours and the patterns can be exquisite. Sundews (drosera) get their name from the abundant dew-like sticky nectar that is secreted at the ends of the very fine tentacles on the branching leaves. Insects are attracted to this nectar, and, as they rest on the tentacles to enjoy the feast, they are pulled into the centre of the leaf for digestion. These are probably the easiest of all of the carnivorous plants to grow. Venus fly traps, pitcher plants and sundews love a wet, sunny position, so sit the pot in a tray of water outside in the sun. They may become dormant during winter, but will re-emerge in spring. Use a potting mix that contains a lot of peat moss so it will hold moisture well. These carnivorous plants are really easy to grow at home, and seem to hold a particular fascination for kids, so they might make an ideal Christmas present for an inquisitive young person in your life.